Eye Kandy Cosmetics launched a full line of glitters made specifically to wear safely around the eyes. I found that these glitters were perfect for use in nail services. Eye Kandy Cosmetics launched a full line of glitters made specifically to wear safely around the eyes. I found that these glitters were perfect for use in nail services. They are the finest glitters in the cosmetic industry, which allows them to blend smoothly. The sparkle factor is captivating. Eye Kandy comes in 60 colors that can be mixed to create an infinite number of possibilities. Some of the glitters are available in two sizes, Super Fine (“SF”; the most versatile) and Fine (“F”; the larger surface reflects more light), plus there are Sugar (“S”) glitters that are transparent whereas the other glitters are opaque. Eye Kandy also offers 25 Mineral Eye Shadows that are also great to incorporate into your nail art. Use them alone or combine them with glitters for a multi-dimensional effect. 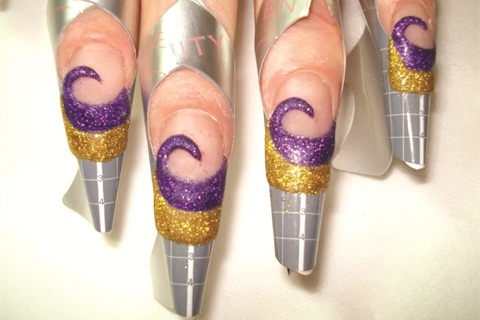 When you’re creating nail enhancements with embellishments like glitter, keep in mind that the strength of the nail comes from the type of product you are using and the structure of the nail. When adding glitter to acrylic, use a ratio of no more than 1 part glitter to 3 parts acrylic powder. Adding more glitter may cause your client to experience service breakdown. Also, all glitters need to be encased into your nail structure. If you fail to do this, you will lose all the beautiful color on the glitter when you file. 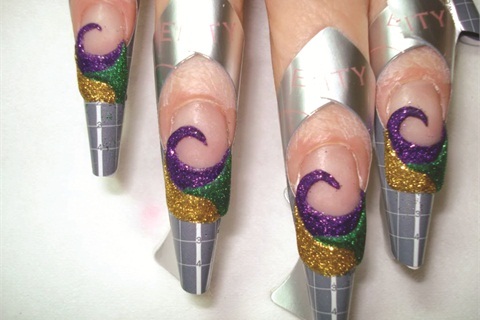 Here are step-by-step instructions for using Eye Kandy Cosmetics with acrylic to create a Mardi Gras-inspired nail design. 1. Mix 1 scoop of Eye Kandy Cosmetics glitter in #54 Sour Grape to 3 scoops of clear acrylic powder. Mix 1 scoop of Eye Kandy Cosmetics glitter in #56 Sour Berry to 3 scoops of clear acrylic powder. Mix 1 scoop of Eye Kandy Cosmetics glitter in #58 Bananarama to 3 scoops of clear acrylic powder. 2. 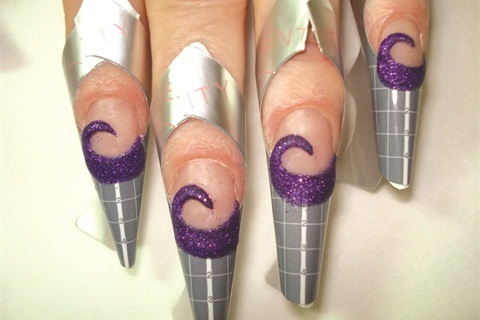 Prep the nail surface and apply forms. 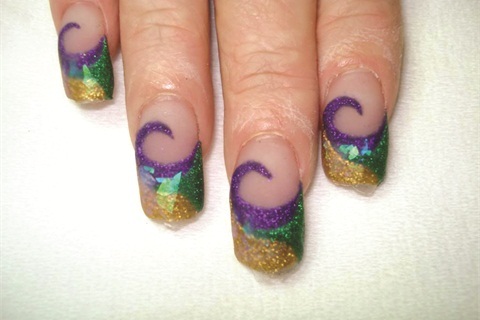 Place a bead of the Sour Grape acrylic mixture on the nail, then begin to shape it into a swirl. Keep your design thin. Wipe the brush to remove excess glitter. 3. 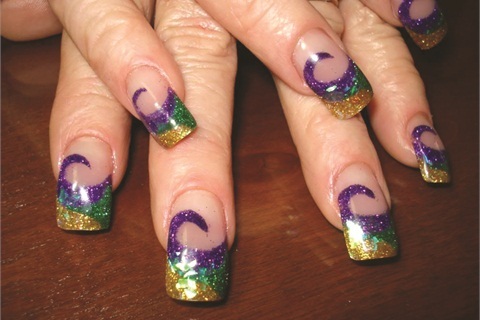 Place a bead of the Bananarama acrylic mixture on the nail, then shape it around the purple swirl to continue the design. Wipe the brush to remove excess glitter. 4. Place a bead of the Sour Berry acrylic powder between the purple and gold, then shape the green bead into the design, making sure to keep the design thin. 5. Apply large pieces of mylar over the design. Place a bead of clear acrylic over the entire nail to completely encase the design. If extra acrylic is needed to achieve the correct nail structure, then do so at this time with the clear acrylic. Remove the forms. File finish the nail, making sure you do not file through the clear powder and into the glitter. Apply top coat. See a step-by-step snowflake design by Ciesla that uses Eye Kandy Cosmetics and gel at www.nailsmag.com/EyeKandyGel. Tina Ciesla has been a nail professional since 1987, is the owner of Blooming Nails Salon in Birmingham, Ala., a Nail Artist Educator for Entity Beauty, and a retailer of Eye Kandy Cosmetics.